Featured in Muncie Power Quarterly, Issue 4, 2014. Jim Archambault can calculate in his head exactly how long he has worked for Muncie Power Products. “Twelve years, five months and two days,” Archambault said assuredly. As distribution center manager at the company’s Houston site, Archambault takes pride in accuracy. “Details are a very big part of our job,” he said. Why are customers loyal to the brand? A lot of companies make changes that take them away from what made them successful in the first place. Muncie has evolved by remaining true to its core values. The company has smart management, what I consider the best in the industry. When I compare us to some large hydraulic equipment producers and people who make different components, I don’t see them with the continuous and sustainable growth. Muncie makes smart decisions that allow it to develop new products while remaining close to the core values and keeping the quality products people can believe in. What should be the key goal of any site manager? For me, the most challenging thing should be safety. This facility has been open for more than 12-1/2 years, and we have never had an accident of any kind. It doesn’t cost a lot to have a safe, productive workplace. You have to look two steps in front of what you are doing and set standards and principles. It’s one of those little ways that you indirectly affect how well you can put your product into the market. It may seem abstract, but if you have a safe workplace, you are not driving up costs that are unpredictable — and everyone goes home happy. What do customers need from Muncie sales staff? A lot of people come here with complex problems, and someone has to have an answer for them so they can go about doing their job. They don’t need to get bogged down in technical information. The hydraulic and power take-off market is widely used but not widely understood. Muncie’s employee training is the best in the industry, hands down. What we are really in the business of is providing solutions for our customers. What is the first thing you want new employees to know? Muncie products don’t require a tough sell. Quality makes the job so much easier. There’s a certain confidence that builds in all Muncie employees who go through the training process. You develop very long-term relationships with a lot of people. You talk to them about the technical aspects of the products, but also that they are making an investment-grade purchase. The equipment is going to pay them to have it. How has technology helped you better serve customers? The evolution of the Muncie website has helped a lot of people understand the market. It has a technical training course you can take online at your own pace. You can go through the basic hydraulic and power take-off training courses and Muncie will mail you a certificate for each section completed. I think it’s an excellent addition. How do you keep employees motivated? If you have a job where you don’t have to think about anything, you really wonder if you are in the right place. The workplace needs to be stimulating, and there is a lot to learn. They need to think, and they need to be involved. The Muncie product line is complex, but once you understand the code, it unlocks a whole grand world of complex things to do at work. 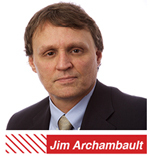 Jim Archambault is a Distribution Manager for Muncie Power Products in Houston. He was a former ironworker and was employed as a connector for eight years before joining Muncie Power just over 12 years ago.